Beautiful Country Location: Fresh air. Evergreen trees everywhere. City-hustle? Not here! Clean Facility: Healthy, friendly setting with cozy, home-like feeling. Food: Bring your dog's usual food. We're happy to feed kibble, canned, homemade or RAW. Outside: 6 Daily fresh air playtimes. Fenced 1/2 acre paddocks. Medication: We will administer any oral medication that you supply, at no extra cost. We DO NOT charge additionally for administration of any medications, supplements, creams, eye drops, eardrops etc. Please ensure that you bring “Pill Pockets” or other edible material to place oral medication in if needed. We do not give injections. Grooming: We will bring your dog to Belcourt Pet Spa in Bragg Creek for grooming and bring him back for you all freshened up. Ask about pricing. 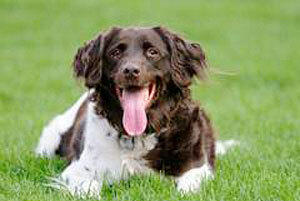 Personalized Attention: Let Kim or Harry care for your pet with personalized attention. All day. Every day. We think it is the only way to care for your pet! Facility is 3 buildings, totaling 2,500 sq.ft. with their own exercise areas. Indoor area is designed to allow natural light, ventilation and of course, cleanliness. The heated indoor individual runs have ceramic tile flooring and are spacious (4 x 8 x 10). Bed or something to sleep on. Your dogs own food. NOTE: Please bring extra couple of days instead of measuring exact. We might accidentally spill a breakfast with an excited dog or you might be delayed in your return. In the event that any of our guests require emergency medical attention, we have a house call vet or will use the Fish Creek Animal Hospital. We reserve the right to evaluate any emergency and will call on a veterinarian if we feel it is necessary for your dog’s health. All medical and transport expenses are incurred by the dog’s owner. IMPORTANT: We require all dogs be vaccinated against Parvovirus, Rabies, Distemper and Bordetella. Please attach a copy of your dog’s current vaccination records to this application and bring it with you when you bring your dog to be boarded. We do accept titre records in lieu of vaccination records. These MUST BE updated at a minimum of every three years. Ask your vet for more information. PLEASE NOTE: we are not responsible for destroyed bedding or toys, lost toys etc. 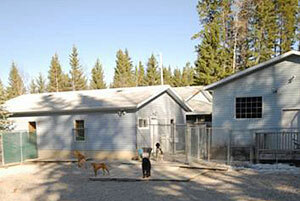 Do not bring your "one of a kind" or your 'sentimental toy' to the kennel. ﻿PLEASE READ:﻿ Blue Ribbon Kennels allows the dog(s) in our care to have the freedom to run, play and interact with one another. We do our best to ensure all the dogs are suitable for their playmates, but sometimes the rough housing can get kind of hairy. 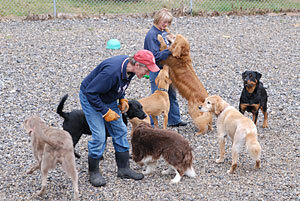 If you do not want your dog to interact in a play group, please let us know. With this kind of interaction, we cannot provide a "sterile" environment for the dog. We highly recommend that your dog be treated for canine cough and parasites. 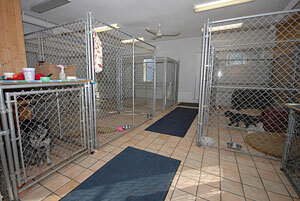 We always strive to do our best at keeping our kennel clean and safe for your dog. If you have any questions about anything, please ask! !